Shawna has more than 20 years of experience in local government service. Throughout her career, Shawna has led and managed operations as varied as legal support functions, public library services, and emergency communications enterprise governance. Most recently, Shawna served as the architect and leader of the continuous improvement program for the City of Carrollton, Texas. In this role, Shawna worked with partners throughout local government to gain a better understanding of operational performance, identify opportunities for improvement, and develop strategies to create desired future states across functional areas. Shawna is an experienced operational analyst, having partnered with subject matter experts and accomplished leaders in fields including police operations, human resource management, facilities management, parks and recreation services, library services, and more. Projects have included staffing assessments, organizational structure reviews, operational procedure evaluations, performance measurement program development, performance analysis, and strategic planning. In all projects, Shawna works diligently to align community values, strategic priorities, and operational practices. Shawna’s expertise in operations analysis, project management, performance assessment and management, organizational structure analysis, strategic planning, interviewing techniques, and negotiation facilitate this alignment through a discovery process yielding customized solutions befitting the unique needs and goals of each operation. Shawna has served as a project lead and interim Executive Director during the establishment of a newly formed local government corporation consolidating emergency dispatch operations of four cities. In addition, she remodeled and led strategic planning initiatives for multiple cities, led a project to review the use of local Hotel-Occupancy Tax revenues, led community survey projects, and developed and managed a multi-million dollar bond proposal. Shawna earned a bachelor’s degree in criminal justice from Missouri Western State College and a master’s degree in business administration from the University of Kansas. 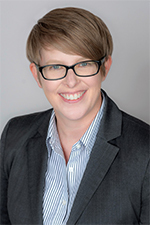 Shawna has served as a speaker for many local and regional professional organizations including the Texas Municipal League, Urban Management Assistants of North Texas, and the State of Kansas Office of Victim Assistance.